I am always looking forward to these meatballs, they are super flavoured, moist and crispy! A total must have on a Ketogenic diet since they are ridiculously easy to make. You can batch fry them and serve them the next day or even freeze them like I do. They have few ingredients and they can also be adapted with different keto veggies, like zucchini or spinach. 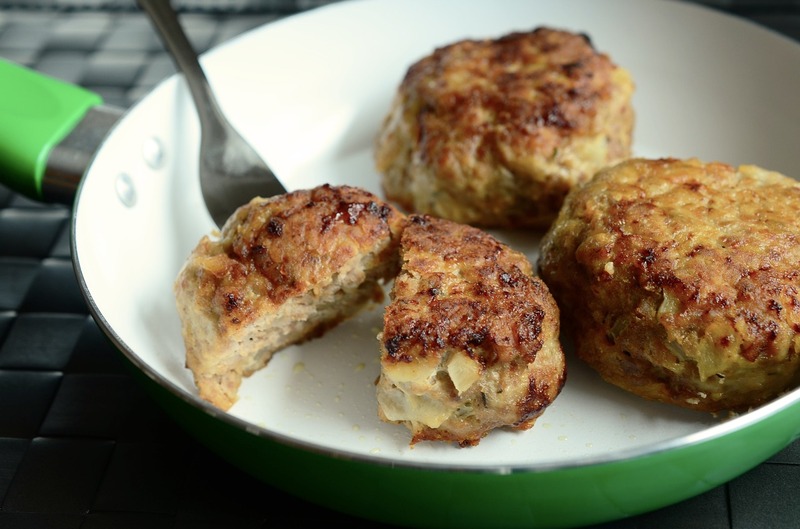 I use parsley because I love the taste, but dill in another popular option for these meatballs. For this recipe, I also use tight chicken meat that I grind myself at home using an electric meat grinder. This is because it is super hard to find good ground chicken meat here. Usually, the one we find for a reasonable price is dry because it is made predominantly out of the chicken breast. So self-grinding makes total sense for me. As for the frying, even if you are not on a ketogenic diet, coconut oil is proven to be the healthiest option there is. Studies have shown that you can fry foods in virgin coconut oil for up to 8 hours without any changes in its quality. Add all the ingredients in a large bowl: the egg, onion, garlic, parsley, salt and pepper. Mix everything by hand and let the paste rest in the fridge for about 15 minutes. Scoop similar size meatballs with a spoon or ice cream scooper, to make sure they are even. Model them with wet hands and then flatten them out, to make sure they fry well in the middle as well. Heat up coconut oil in a pan on high heat, enough to cover the meatballs and make sure they don't stick to the pan. Set the heat on medium and fry the meatballs 2-3 minutes on one side and then another 2-3 on the other side, or until they get a nice golden brown color. Scoop them out and let the rest for a few minutes until you serve them. Adding zucchini to your meatball will make them juicier and add extra flavor.